All Digital 8xIN, 8xOUT Dirac Live® correction DSP with AES-EBU or SPDIF in/out, Tascam DB25 to XLR AES-EBU pigtail or DB25 to SPDIF/COAX pigtail, perfect fit for Studio, Broadcasting, Hifi, Live Sound and Digital Cinema (DCi) applications. The DDRC-88D is the digital I/O version of the well-known DDRC-88A analog I/O Dirac Live processor. Housed in a compact lightweight chassis, the DDRC-88D provides a full 8 channels of Dirac Live room correction via professional AES/EBU digital inputs and outputs. This unit is also available in SPDIF in/out via COAX cable. With 8 channels of Dirac Live processing, the DDRC-88D is ideally suited for professional surround-sound studio, broadcasting and Digital Cinema (DCI) applications. 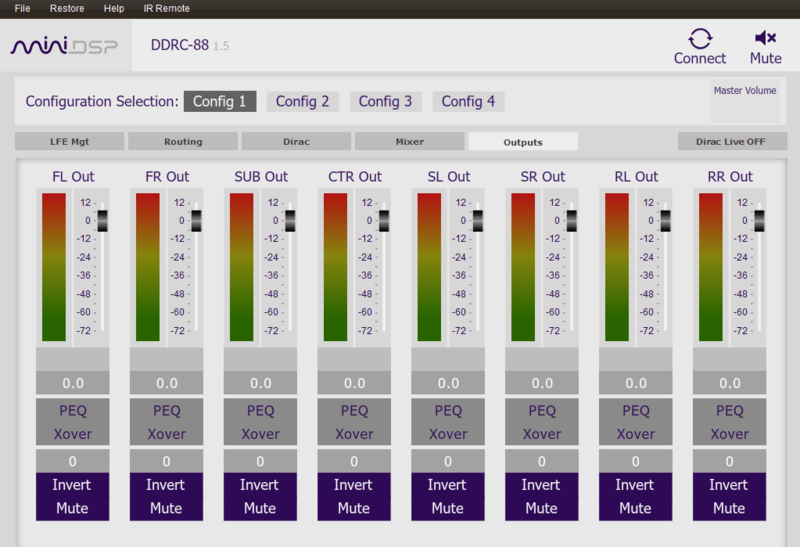 Dirac Live’s renowned room correction capabilities ensure the most accurate and immersive surround experience for mastering and playback. An inexpensive optional software upgrade adds additional processing functions including bass management and active speaker implementation. The DDRC-88D is configured via USB and a user-friendly software suite that runs on Mac or Windows. Four full preset configurations are stored onboard and can be recalled easily from the front panel or with a remote control. An optional half mount rack adaptor allows easy rack mount installation. STOCK UPDATE: Please note that only the AES-EBU version of the DDRC-88D is currently shipping as the SPDIF option is currently out of stock. We expect about 2months before we can once again start shipments of the DDRC-88D SPDIF. Thanks for your patience.